Active fire protection is characterized by detection and response. Detection of a fire through smoke or heat sensors initiates a chain of events that reduces threats from the fire. Once a detection system is activated, other programmed actions ensue, including: sounding of alarms, closure of smoke and fire dampers, closure of automated fire doors through de-energizing of magnetic door stops, and opening of fire sprinklers or other fire suppression system. Once detected, the fire can be controlled or extinguished manually through the use of extinguishers and fire hoses or automatically by fire sprinklers, fire fighting foam systems, hypoxic air systems or other devices. IBC Chapter 9, Fire Protection Systems, prescribes minimum requirements for active fire protection systems to perform one or more of the following functions: detect a fire, alert the occupants or fire department of a fire emergency, control smoke, and control or extinguish the fire. Fire protective systems must be installed, operated and repaired in accordance with the International Fire Code (IFC). Automatic sprinkler systems must be equipped with approved audible alarms that are monitored for integrity by an approved supervising station. The alarm must be installed on the exterior of the building in a location approved by the building official. This alarm is not intended to be an evacuation alarm. However, when a fire alarm system is installed, the sprinkler system must be interconnected with the building fire alarm system so that, when the sprinkler system activates, it sounds the evacuation alarms required for the fire alarm system. Where the code requires that a building or portion thereof be equipped throughout with an automatic sprinkler system, the sprinklers must be in accordance with NFPA 13, Standard for the Installation of Sprinkler Systems. However, where allowed in buildings of Group R occupancy, up to and including four stories and not greater than 60 feet in height, the automatic sprinkler system shall be in accordance with NFPA 13R, Standard for the Installation of Sprinkler Systems in Low-Rise Residential Occupancies. IBC Chapter 9 regulates the installation of automatic sprinklers in a building based on certain factors, such as occupancy group, height, size of the building/fire area, and occupant load. All water supply control valves and water-flow switches are required to be electrically supervised in accordance with Section 903.4. Central stations, remote supervising stations or proprietary supervising stations are approved services recognized in NFPA 72. Note: The construction of one- and two-family dwellings is generally governed by the provisions of the International Residential Code (IRC), which allows the installation of an automatic sprinkler system in accordance with NFPA 13D, Standard for the Installation of Sprinkler Systems in One- and Two-Family Dwellings and Manufactured Homes. If the one- or two-family dwelling does not comply with the building geometry limitations of the IRC, then the building must comply with the requirements of the IBC and an NFPA 13D system can still be used, but the installation of the 13D system will not provide for any increases to the allowable height or area. Automatic 13D systems in one- and two-family dwellings do not require electrical supervision, through exception. Under previous versions of the IBC, an allowable increase of either 200% for a multi-story building or 300% for a one-story building was permitted. However, the 2015 IBC introduced a new, more user-friendly method of determining allowable increases. Maximum allowable height and number of stories can now be determined directly from Tables 504.3 and 504.4, and the maximum allowable sprinkler area increase can be determined from Table 506.2. These tables now have tabulated values for nonsprinklered buildings, buildings with NFPA 13-compliant systems, and buildings with NFPA 13R-compliant systems, or a multi-story sprinklered building two or more stories in height. Many occupancies have area thresholds beyond which sprinklers are required per IBC Section 903. 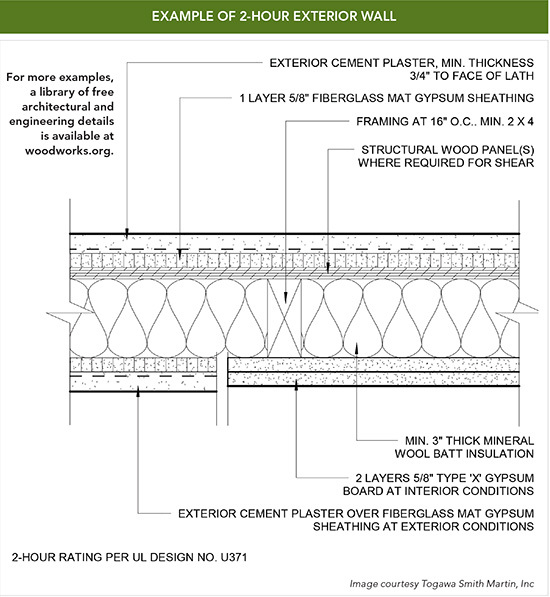 The same thresholds apply to all construction types. When increases are taken for open frontage in nonsprinklered buildings, the allowable area per floor can exceed allowable fire areas and a sprinkler system may be required. If sprinklers are provided, however, allowable area increases for both sprinklers and open frontage may be taken. Alternatively, fire areas may be kept below sprinkler thresholds by compartmentalizing floor areas with fire-resistance-rated construction in accordance with the definition for fire area and the requirements of Chapter 7. The requirement for sprinklers can also be triggered by specific use, height above grade, or occupant load. For instance, although unsprinklered Group A-2 occupancies (restaurants) may exceed one story above grade in Type III construction, if the A-2 is above the level of exit discharge (typically the first story), or has an occupant load exceeding 100, the A-2 building must be sprinklered in accordance with IBC Section 903.2.1.2. Increases for both open frontage and sprinklers could then be taken. Section 507 provides provisions which allow certain occupancies or types of construction to be of unlimited area. As an example, the area of a nonsprinklered one-story F-2 or S-2 building is not limited provided the building is surrounded and adjoined by public ways or yards not less than 60 feet in width. This particular provision applies to any construction type.